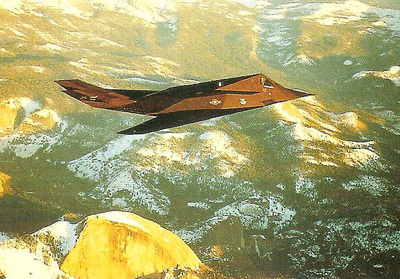 Lockheed F-117A flying over Yosemite National Park, California. The F-117A employs stealth technology to render itself practically invisible to radar. The aircraft's materials and design are such that its radar cross-section (RCS) – the imaginary size of a perfectly reflecting object that would reflect the same amount of energy – is reduced to within the levels of background radiation. To achieve this, compromises are required in terms of the aircraft's performance and operating and maintenance costs. Stealth technology is the various methods used to render an aircraft, or other vehicle, nearly invisible to radar, heat, and visual detection. To achieve "invisibility", a stealth aircraft must have sympathetic airframe design (all radar-reflecting "hard" edges smoothed away), engine exhaust dampers that mask and disperse jet efflux, and radar absorbent material that "holds" electronic emissions rather than reflecting them. This coating has to be regularly applied, since it is to sensitive to water and wear. In 1983 the American Lockheed F-117A became the first "stealth" aircraft to enter frontline service; it was followed a decade later by the Northrop B-2. The F-19 stealth fighter was used in the Gulf War (1991). Few aerodynamic advances have had such a profound effect on military aviation as stealth technology.